When it comes to sound quality, most users will attest to the Sennheiser brand – and with the RS120, users can now enjoy it with the flexibility that comes with wireless headphones. First released in 2004, the RS120 has ‘aged’ well over the years. Perfect for listening to music, as well as watching TV or videos on your computer without bothering others in the room, these headphones are a rare pair of wireless headphones that might even outperform its corded cousins, in more ways than one. The RS120 runs on a radio frequency (RF) of 900MHz. Being an older version of wireless headphones, they are not compatible with Bluetooth technology. However, users will still find plenty of use for RF headphones, especially when used with non-Bluetooth devices such as TV and home Hi-Fi systems. Boasting high stereo sound quality, which has become synonymous with Sennheiser headphones, the RS120 carries a pair of dynamic drivers for well-balanced sound with superb clarity and bass response. 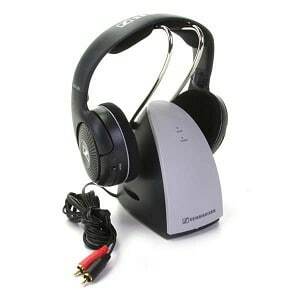 With a frequency response between 22Hz to 19,500 Hz, the headphones are able to handle both low and high frequencies well. Featuring warm overtones in favour of a flat response, the sound has a CD-like quality that is easy on the ears and non-fatiguing so users can watch their TV shows for hours on end. An internal amplifier boosts low frequencies for an optimized bass, so they are great for watching action movies and listening to bass-heavy tracks. 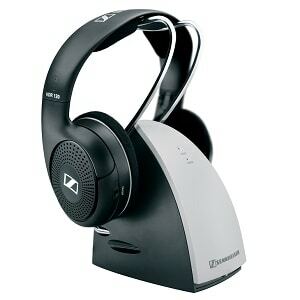 The Sennheiser RS120 has a high sensitivity rating of 106dB. Meanwhile, a low impedance of 24ohms means that they can be plugged into portable music devices such as CD players or tablets, as well as home audio systems. While reception is generally clean and free from static, there will be some buzzing and hissing from time to time – hindering what would otherwise be a listening experience that is similar to corded headphones. Weighing just over 8 ounces, the RS180 is made from a light but durable plastic material, with large oval-shaped ear cups that sit gently on the ears. Their open-back design provides a natural listening experience by allowing some ambient noise to blend in with the audio, giving users more awareness of their surroundings. The volume turns up high with minimal distortion when users need more privacy. However, due to this feature, they are not very good when it comes to noise-cancelling. They do a decent job at noise isolation. Meanwhile, the headband is padded for maximum comfort, and features an adjustable strap that can open and close to fit different head shapes and sizes. The cups are also covered in a velour-like fabric for maximum comfort. These go on the ears instead of around them. While comfy, they do not clamp down tight and are less secure than grippy headphones, so any vigorous movement will cause them to slip out of place. 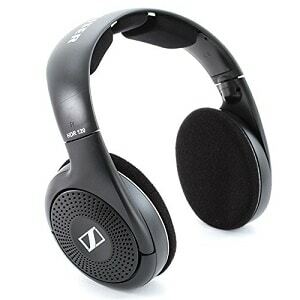 One major advantage that an RF-type wireless headphone has over newer Bluetooth versions is their compatibility. Bluetooth headphones require Bluetooth-compatible machines to work. With older audio equipment, users will have to buy transmitters and receivers separately. With RF-type wireless, however, setup is much more convenient. The RS-120, for example, comes with a docking station, which works as a wireless transmitter. This ‘base’ is plugged into analog outputs of audio sources such as a TV or computer. It then transmits signals to the headphones, without the need for cables. The set comes with a standard 3.5mm audio output jack as well as RCA cables, which are compatible with most devices. The RS-120 is a winner when it comes to battery life. Equipped with two rechargeable AAA NiMH batteries, users will enjoy over 20 hours of playback time. The base doubles as a charging station and the headphones charge easily by simply placing them in the metal cradle. A LED-light is helpful to indicate their charging status. There are three RF channels to choose from, and a selector dial on the side of the cups allows users to choose and adjust the settings for an interference-free channel and clear reception. Other controls, such as volume, as well as power on and off, are also located in the same space. The only drawback would be that the dials are placed very close to each other, so sometimes while fine tuning the channel you might encounter a burst of volume instead. The headphones have a very wide range, much wider than regular Bluetooth wireless headphones. Users have the flexibility to roam up to 300 ft, as the signal can even penetrate walls and ceilings – although reception does get significantly weaker the further away they get from the base. A really great feature of the RS-120 is that the base can work with multiple headphones, making them ideal for gaming sessions with friends, or while sharing music with family without playing them over the speakers. Once the audio source is turned off, the transmitter automatically switches off after five minutes to converse power. 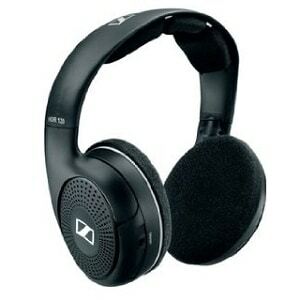 Users should note that these headphones might cause interference with cardiac pacemakers and implanted defibrillators. Despite being an older model, the RS120s have sound quality comparable to corded headphones – as expected from a brand like Sennheiser. Other than the occasional interference, users will enjoy a near-seamless listening experience with CD-like audio. They are priced affordably and are a good value of money purchase that will last for years to come.